My desktop computer is still in the repair shop. I'm hoping it will be ready for me to pick up before the 4th. I'm happy to have my Kindle Fire to write a post with, but taking pictures with it is another story! In the meantime I've been spending more time with needle and thread. A while back I began a hand sewing project using 3/4 inch paper hexagons, and flour/feed sack fabrics. Some of the fabric came from fat eighths purchased at the Des Moines AQS show several years ago. Other pieces once belonged to my Aunt Helen, and still others are from a relative of my retreat roomie, Carole. Combined, they make up one of my all time favorites... a diamond shaped table topper. The hand quilting of choice for me was in the ditch. For backing I used an off white wool felt, and blanket stitched around the outside edge with the same cotton thread I used for the hand quilting. The finished size is 13" x 22". I think old feed sack fabric is fun to work with... I love the texture of the looser weave, the flowery prints, and the vibrant colors. It's no wonder why women of the 30's and 40's incorporated these lovely fabrics into their handiwork! I really hope to have my computer back in time to write a post celebrating our nations 237th birthday on the 4th of July. I love everything about the day... parades, picnics, sparklers, and the waving of the red, white and blue. If not, I'll use this time to wish all of you a happy and safe 4th of July!!! Wave our country's colors proudly... and God Bless America!!! ...and oh boy, it did some damage! Both of my cordless phones are fried, the receiver for the flat screen TV died a quick death, but the real damage is to my desktop computer. It won't power up. The phones were easy to replace, thanks to my local Target store. A new receiver for the TV should arrive in a few days. I'll deal with the computer issue on Monday when I can talk to a real person instead of a troubleshooting website by way of my smart phone. Blogging from my Kindle Fire will have to do. Fortunately I still have a working sewing machine!!! After a very busy week, (a two-day visit from my brother on his way to Colorado, and a dance recital that featured two of the cutest ballerinas on this earth, my granddaughters), I was able to find some time to work on my June Small Quilt Talk project, the Flowerpot Applique Wall Quilt, by Kathleen Tracy. I really enjoyed making the flowers using the ruching technique. I'm ready to begin the applique of the stems and leaves, with a goal of completing this project by the end of the month. 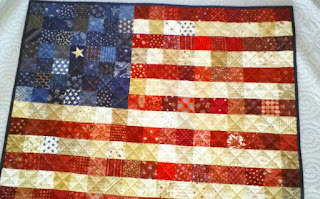 Also on the to do list is piecing more patriotic blocks for the Quilts from the American Homefront quilt. 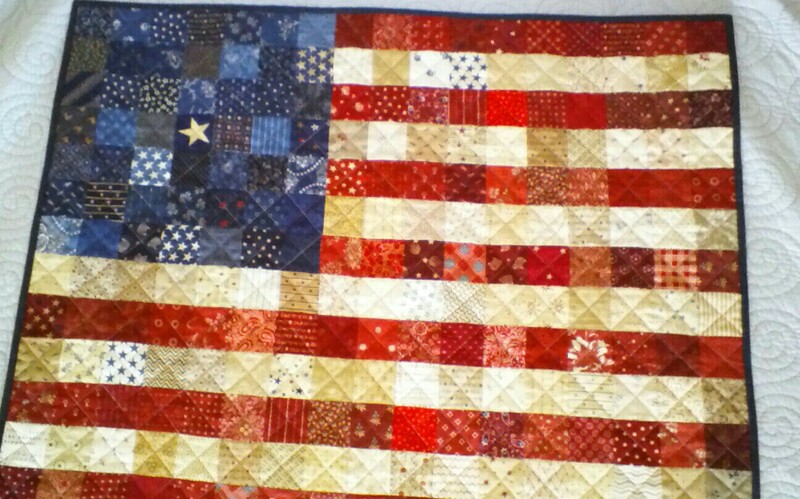 My birthday was Flag Day and it was extra special with the delivery of a wonderful flag quilt made for me by my sister! I love it!!! This picture isn't the best... taking photos with the Kindle is challenging to say the least! Mary Jo also sent some scraps of red, white, and blue fabrics from her stash for me to use on my Homefront quilt. Thanks Sis!!! I'm very far behind in blog reading! It's a sunny and hot day, so I plan on spending some time this evening on my shady patio to catch up with all of you and your sewing projects!!! Have a sewful week!!! With predictions of warmer temps and sunnier skies in the coming week, many Iowans are loudly cheering the promise of summer finally arriving! Bring on the sunshine! Even with lots of WIP's neatly stacked on my cutting table, and in baskets tucked in the corner of my sewing room, I'm looking forward to making Kathleen Tracy's Small Quilt Talk selection for June. From her book Remembering Adelia, Kathleen has selected her Flowerpot Applique Wall Quilt pattern. This darling little wall quilt will include something new for me... ruching. Kathleen explains that ruching is a French term that means to gather or pleat. Kathleen's pattern includes 5 flowers using this technique. I had to look closely at the picture in the book... at first I thought the flowers were yo-yos. Kathleen's technique utilizes pinking shears to achieve the feathery soft edges of the flower petal. I have most everything I need cut, ready to piece, and applique. I didn't find anything in my stash that I like for the stripe border... guest this means I'll have to make a trip to my LQS... what's a quilter to do? You can learn more about Kathleen's Small Quilt Talk projects by visiting her website here. On her blog sidebar is an icon to click on. I hope the coming week gives all of you some valuable sewing and/or quilting time! I finally found the time to begin the process! I haven't yet decided how many blocks I will make, or how large of a finished quilt I want, but the block making has begun and that's progress. A real bonus to the book are the featured letters that seven WWII veterans exchanged with their families and loved ones, waiting for them back in the USA during 1942 through 1945. In her acknowledgements, Rosemary thanks those families who shared these "treasured letters...and preserved their stories." I most humbly, thank them too. I couldn't resist taking advantage of one of my newly planted flower pots on my patio, and the early evening sun, for a few pictures. Left to right the blocks are A Comfort to Me, and Dangerous Job. Left to right the blocks are A Soldier Dream, and Red Cross. I am using fabrics from my stash in mostly the traditional red, white, and blue colors that "speak" America! Left to right the blocks are Air Combat Intelligence Officer, and Our Squadron Planes. All of the blocks will be 6" finished. Above is a picture of the front cover of Rosemary's book. Can you see all the orange sticky tabs? Each one represents a favorite block. I have a long way to go, but I'm enjoying the ride! You can learn more about Rosemary Youngs by visiting her website. Click here for a direct link. And that means it's time for the Simply Charming Every Other Month Mini Sew Along! For those of you who are participating in this sew along, or if you want to join us for this month, this sew along is hosted by Darlene at Quilting Daze and myself. It all started with a dare from Darlene... read about it here. This is a no pressure sew along... the only requirement is that you pick out any mini quilt from Tara Lynn Darr's wonderful book, Simply Charming - Small Scrap Quilts of Yesteryear, use fabrics of your choice, and complete your mini before July 5th, 2013! My choice for June is Off the Beaten Path. I had two charm packs of Friendship by Howard Marcus for Moda to work with. The finished size of this mini is 13" x 16," which is smaller than the pattern in the book. I omitted the wide outside border because I didn't have any yardage from the fabric line. I made the narrow 1/2" border from the solid brown charm squares. For the binding I used the various red fabric charms. I learned three things making this mini... 1) I need to work on squaring up my little blocks, 2) I need to work on my piecing, and 3) I need to practice quilting in the ditch! For the backing I used leftover charm squares sewn together. The star shaped mini alphabet pillow is an original cross stitch pattern I designed and stitched in 2002. Little did I know how perfectly the thread colors I used to stitch the alphabet, would match the fabrics in a mini quilt I would make 11 years later! Tara's Simply Charming book is available from Amazon.com. You are welcome to link your June mini quilt below. 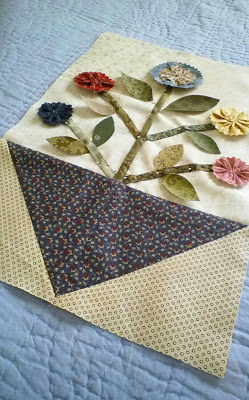 PLEASE LINK TO THE BLOG POST FEATURING YOUR MINI QUILT. This makes it easier for those readers who want to view them... by clicking on your name below, the reader should be taken to the post showing your mini quilt, and not the latest post you have created. If you are not sure how to do this, send me an email and I will walk you through it. If you don't have a blog but want to share your quilt, send me an email, including a picture of the quilt, and I will link it for you. You have until July 5th to link! Join us!